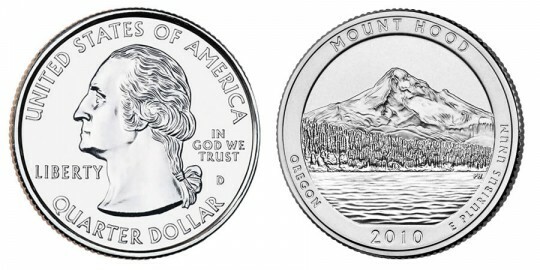 The fifth and final coin for 2010 as part of the US Mint's America the Beautiful Quarters Program will be the 2010 Mount Hood National Forest Quarter. This quarter is the first for the series to honor a site other than a national park. Mount Hood was officially named in 1792 after a respected British Royal Navy Admiral. It remained in relative obscurity for years before being added to the national forest system in the early 1900's. Today, millions of visitors annually partake of the resources of the area including scenery, boating, fishing, hunting, skiing, etc. The forest is located only 20 miles to the east of Portland, Oregon. The US Mint will also be creating three inch diameter .999 fine silver quarter dollar bullion coins featuring the same designs as is on the circulation quarter. The inscriptions "UNITED STATES OF AMERICA," "QUARTER DOLLAR," "LIBERTY", "IN GOD WE TRUST" and the mintmark will be on the obverse of the quarter along with a portrait of George Washington designed by John Flanagan. Phebe Hemphill designed and sculpted the image of Mount Hood and the lake and forest in front of it which is found on the reverse. Also shown are the inscriptions "MOUNT HOOD," "OREGON," "2010" and "E PLURIBUS UNUM".